Lewis Carroll se u skrivinom: Charles Lutwidge Dodgson sì de veri nom de skrivori we sì profesor matematiki be Christ Church in Oxford. Dodgson inizì de storij be 4i Ʒul 1862, wan he pasitì in u remibark su riv Isis in Oxford sam ki Reverend Robinson Duckworth, ki Alice Liddell (10 jare), dota de Dekani od Christ Church, id ci du sestas, Lorina (13 jare), id Edith (8 jare). Wim je se klar in de poèm be inìz de bibi, de tri ʒikas pragì a Dodgson retalo u storij id, gonvolim prim, he inizì retalo lo de pri versiòn de storiji. Je ste mole mij-celen reperade a da pin persone tra tal de bibiteksti som, we vidì fendim publizen in 1865. Uropi se u struen linga wen i av som kreaten; je se u sintèz Indeuropan lingus, klarim bazen su de komùn Indeuropan rode. 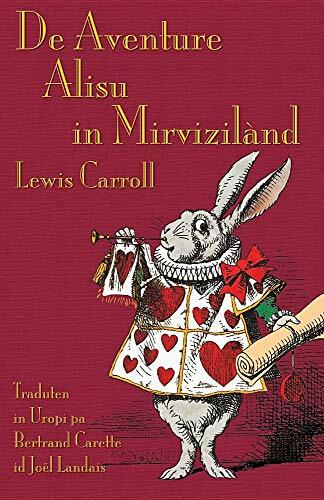 Lewis Carroll is a pen-name: Charles Lutwidge Dodgson was the author's real name and he was lecturer in Mathematics in Christ Church, Oxford. Dodgson began the story on 4 July 1862, when he took a journey in a rowing boat on the river Isis in Oxford together with the Reverend Robinson Duckworth, with Alice Liddell (ten years of age) the daughter of the Dean of Christ Church, and with her two sisters, Lorina (thirteen years of age), and Edith (eight years of age). As is clear from the poem at the beginning of the book, the three girls asked Dodgson for a story and reluctantly at first he began to tell the first version of the story to them. There are many half-hidden references made to the five of them throughout the text of the book itself, which was published finally in 1865. Uropi is a constructed language which was created by myself; it is a synthesis of Indo-European languages, explic-itly based on the common Indo-European roots. If you have any questions about this product by Evertype, contact us by completing and submitting the form below. If you are looking for a specif part number, please include it with your message.